Engravers Register reaches major milestone! The Engravers Register is pleased to announce a major milestone…. We now have 100 businesses registered! So if you’re an engraving business, now is the time to get on board and register with The Engravers Register. If you’re a customer, send us through what you would like and we will match you with an engraving business that can do the job for you! Looking forward to the next 100 businesses coming on board and helping to give back to the engraving industry. One of our website sponsors, evright.com, recently had a lot of glass corporate awards to complete, and blogged and uploaded videos to youtube about the progress. Evright.com advised The Engravers Register of their recent work, so we thought we would share with you all. It’s definitely interesting reading and viewing – enjoy! There really isn’t anything more exciting than a good trade show. The bump in and outs, the anticipation of a sale or two, and lots of customers with problems we can provide solutions for, all in one place! One of the best industry events in Australia is the Visual Impact Expo, the Sydney 2012 event was where The Engravers Register was launched. 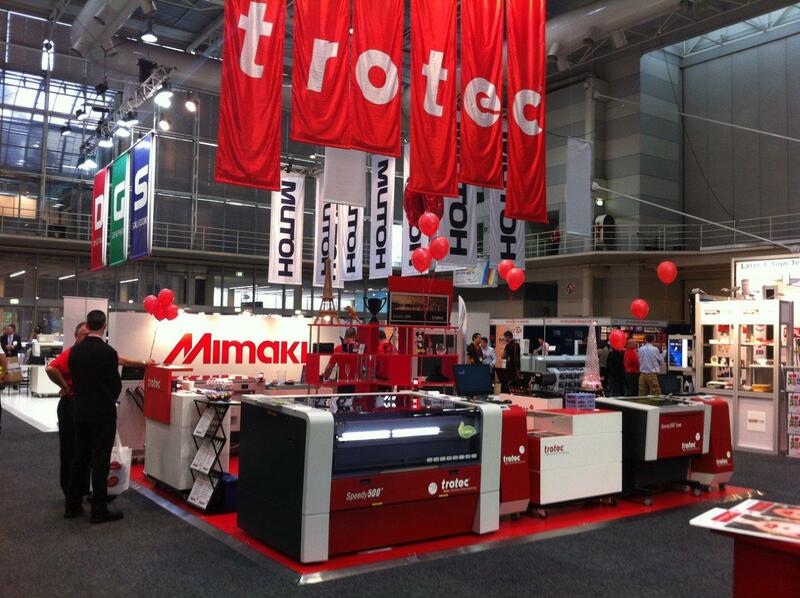 While we were busy launching at the Sydney Visual Impact Expo, one of our website sponsors Trotec Laser Australia, was also extremely busy launching their brand new pride and joy to the Australian market- the Speedy 400. We at Engravers Register hear that the Sydney office of Trotec Laser was so far ahead of the rest of the world they acquired a Speedy 400 machine with the serial number #4 – ie the fourth produced in the world by Trotec Laser. Pretty impressive stuff! Trotec Laser staff were kept extremely busy demonstrating not only the Speedy 400 (which from what we could see had the crowd in awe about what the Speedy 400 achieved – 312 name badges produced in 53 minutes which is 10.3 second a badge!!) but also their vast array of other laser machines which are tailor made to help businesses in our industry increase productivity and profitability. Make sure you talk to Trotec Laser Australia first if you’re looking to upgrade your laser machine/s or innovative ways to expand / increase your business model, they are there to help. Trotec Laser Australia was very prominent at the 2012 Sydney VIIE. Trotec staff preparing before the Expo opened. First stop Australia…. next stop the world! It’s awesome how quickly The Engravers Register has been embraced by sponsors and engraving businesses alike! One of our great sponsors, Woodmarvels.com recently blogged about us, and how happy they were to be involved with engraversregister.com. Have a quick read of their blog when you have five minutes. What’s even better is Woodmarvels.com works around the world…. we wonder how long it will be before the first customer job comes in through The Engravers Register from overseas?! 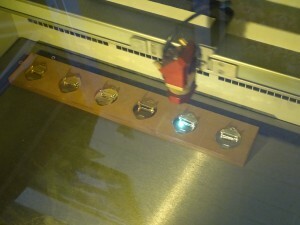 Today’s blog is courtesy of The Engravers Register sponsor evright.com. Jig use preceeds language as it allows you to precisely control the location and/or motion of another tool, enabling you an unprecedented level of repeatability and accuracy – which means better productivity and profitability. Although they are used across a number of fields, we will focus on CNC related jigs for this post. If you have a lot of one-off projects, you might have developed a simple jig to hold material in place if you are dealing with only a few sheet sizes. But if you have, lets say, a hundred medals that need to be Cermark’ed, developing a jig will save you in labor, time and reject costs. Continuing along the lines of having to engrave a hundred medals, a jig will give you far greater precision and accuracy than trying to manually place them one at a time on an engraving bed. 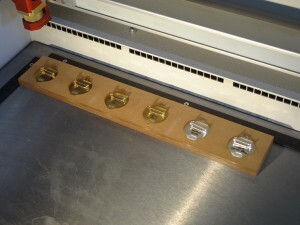 Here is a jig we recently made at Evright.com to hold some medals that needed to be fiber marked using a Trotec Flexx. As you can see, these medals are an odd shape and have protrusions on all sides, meaning manual positioning would only be a lesson in frustration. Using a simple jig not only makes this project possible but also a lot quicker! The number of jigs and combination of jigs are as limitless as your material selection for making one! The best thing about making a jig isn’t usually the jig itself, it’s the quality and customer satisfaction that comes as a direct result of your creativity! 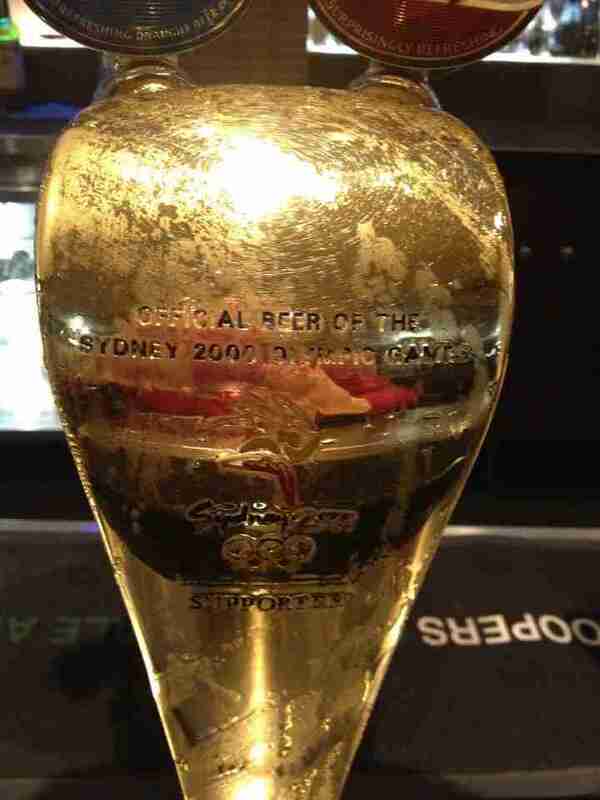 Evright.com produced over 2000 of these beer taps for a Sydney Olympics sponsor or “official beer partner”. The end product is still going strong after 12 years! Just a little inspiration for you when trying to source your next job! We here at the Engravers Register say “cheers’ to that! http://blog.woodmarvels.com/ is an interesting resource that showcases what different products can be constructed using various materials (wood in particular!) Very funky 3D assemblies including a porsche… perhaps the next challenge is a full size porsche! Over to www.woodmarvels.com!! Positioning engraving, cutting, and marking jobs correctly is critical to guarantee perfect results, especially when engraving intricate layouts on expensive or irregular shape materials. Luckily, Trotec’s JobControl’s “Job Outline Function” supports both experienced laser and novice users by allowing you to check the correct position prior to starting the engraving job. This feature ensures the job is positioned correctly every time, which prevents faulty engraving and saves you both time and money! Send the job from your graphics software to the JobControl software. Position the material in the laser. Position the job on the JobControl plate. Watch as the lens carriage begins outlining the shape of the selected job(s). With the laser switched off, the red dot pointer will indicate the outline area of engraving, cutting, and/or marking job. The red dot pointer travels along the effective outline, not along the biggest rectangle. The laser will continue to outline the job until this action is cancelled. This will give you the opportunity to either move the job to another position on the plate or move the object to be engraved. Once you have everything positioned correctly, cancel the job outline function and start engraving. Trotec’s unique JobControl Software offers multiple features that provide functionality, productivity, flexibility, and reliability to the engraving, cutting, and marking process! Today, we are going to highlight the different options available to position multiple jobs, including “Position Jobs Multiple”, “2 Plates Together”, and “Duplicate Job” and how you can use these features as an aid for laser processing. This feature is especially beneficial when a material needs to be engraved multiple times with the same design. When selecting a job in the job queue, instead of double clicking (sends job to top right of plate) or dragging (allows you to freely position job on plate), right click on the job and select “Position Job Multiple”. When the “Multiple Placement” window opens, indicate how many times you would like the selected job to be duplicated. Once you’ve selected “OK” JobControl will automatically position the indicted number of jobs on the plate. If you position two sheets of material side by side in your laser, you can effectively process a job multiple times on two pieces of material while facilitating the “position job multiple” feature. Open “Plate Setup”; located under “Plate” on the top tool bar. When the “Plate Setup” window opens, check “2 Plates Together” at the bottom of the window and select “OK”. If you have two identical jobs to be processed, you can (1) follow the steps above for “position job multiple” or (2) duplicate the job. If you choose to duplicate the job, first position the job on the plate. Once you have the job positioned on the plate, right click on the job and select “duplicate job”. Job control will automatically provide a carbon copy of the job next to the already positioned job. The standard value for the plate setup in JobControl is equivalent to the maximum engraving area of the Trotec laser you are using (i.e. Speedy 300: 28 in x 18 in). If you want to use the multiple positioning command on a smaller work piece, try adapting the plate set up value in JobControl to reflect the actual area of the work piece.